Miss Peregrine’s Home for Peculiar Children has been brought to the big screen courtesy Jane Godlman’s adaption and director, Tim Burton’s welcome morbid sensibilities. Based on a Ransom Riggs novel of the same name, Miss Peregrine’s Home introduces us to the kids with gifts one would expect from a film with such a name, also featuring a mansion that will obviously bring to mind Charles Xavier and his home for gifted kids. Before we get to this home for peculiar kids, we meet teenager Jake (Asa Butterfield) who is drawn into this world via personal tragedy in the death of his grandfather, Abe (Terence Stamp). Abe used to tell a younger Jake stories of a kids with abilities and world were terrifying monsters lurked in the shadows and before his death, he left some clues behind that would give life to the bedtime stories. The clues eventually lead Jake to an island in Wales were an encounter with Miss Peregrine (Eva Green) the guardian of the home housing this particular set of gifted kids. The real experience of this film begins when Jake acquaints himself this new world, a substantiation of all the stories his grandfather told him. We meet children with gifts (Peculiars they are called) ranging from the tried and tested pyrokinetic to the ability to manipulated the growth of plant life to the ability to animate inanimate and, quite chillingly, dead things. This experience however is unfortunately ends almost as soon it begins. Beyond the abilities of the Peculiars, this new world we are introduced is pretty much glossed over where there may have been more to explore. Aside this, the main arch is a bit meh. In the beginning we meet a Jake who is a loner, out of place in the normalcy of two parents and an afterschool job in Florida. But he will come to find out that he belongs alongside the likes of a girl with vicious teeth at the back of her head and another lighter than air, who abode in a 24 hour time loop way back in 1943. This time loop is courtesy the abilities of the pipe smoking Miss Peregrine who also possesses the ability to transform into a (surprise, surprise) peregrine falcon. What’s life like living the same day over and over again, one might ask? This question really isn’t answered. Indeed, this film doesn’t really want you thinking about too much about the rules of time travel despite how integral it is supposed to be to the plot. So enter the towering minion “Hollows” led by Samuel L Jackson’s Mr. Barron and his cronies called Wights in this mythlogy. The Hollows truly are frightening when we see them in snippets the first few times we see them; whether shrouded in the shadows beneath streaks of moonlight or creepily prancing in bright sunny meadows. But the menace is quickly diffused when Jackson’s Barron assumes prominence. Barron’s motivations are as ridiculous as the sight of him eating eyeballs like from a bowl like meatballs. 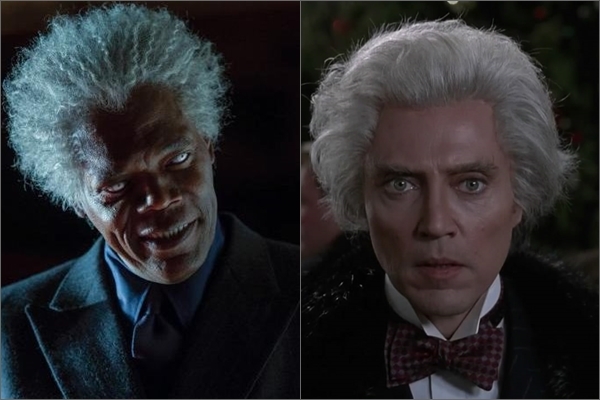 Anytime Jackson comes on screen, the film may appear to border on parody, but Jackson’s character is definitely a parody, of himself or past Burton characters maybe. The film certainly loses any semblance of stakes and menace and really begins to feel like your standard kids movie that is gunning full steam for that happy ending which comes when Burton meshes the scary with the ridiculous to admittedly amusing effect. Miss Peregrine’s Home features Burton’s disconcertingly dark inflections and his quasi-gothic stylised aesthetic, not to mention his obsession with eye balls. A nice warm reminder of the first Burton film I ever saw, Beetle Juice (okay Batman, but I didn’t know it was Burton flick then). It has some very strong moments that tugged at my heart strings; like watching the girl lighter than air, Emma, float around in her blue dress evoking Wendy from the Disney’s Peter Pan. Then there’s that moment when the ever strict Miss Peregrine showed a soft maternal side with a certain character in an incredibly sad scene. The latter point really hits at how good this film could have been, when it decides to tap into the emotion and underlying melancholia of the Peculiar’s existence. There is something incredibly sad about the isolation that comes with being confined to the same space to live a single day over and over again. But the script doesn’t really dig in. It settles for over the top Sam L. Jackson with weird hair, which I’ll admit is amusing. For what is ultimately a kid’s movie, it does not have the awe inspiring charm or earnestness of the Harry Potter films, but it is strong enough to pass as engaging. Burton acolytes will be drawn to the overall style and dark humor but as a story, it wants for a bit more heart and bite.